It’s DONE!! I finished a sweater! 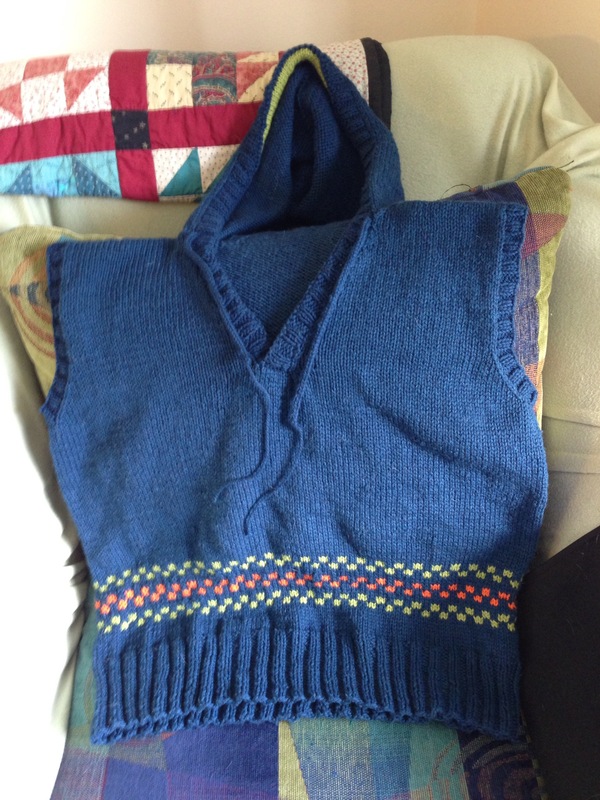 Now, granted it was with a fairly hefty yarn (Spud and Chloe sweater – it claims to be worsted, but I’d put it more at a light aran) and it doesn’t have sleeves (but… but… it has a HOOD!!) – but I finished it! Blocking and everything. Warning: if you work with this yarn it takes a year to dry. I really need to get one of those sweater drying racks that’s like a mesh hammock for sweaters. I had this laid out on towels and it took 4 days to dry – no joke! But none of that is the point. The point really is the satisfaction I get from finally finishing a project and having it come out looking like it’s supposed to. This feeling is still relatively new for me. I’ve made lots of stuff, but not a lot of it (other than home dec or crafty stuff) has turned out like it was supposed to. 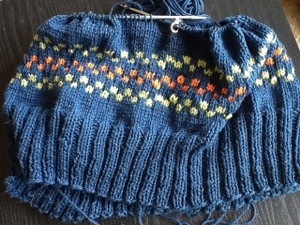 Now, since I’ve been taking classes and have had such things as swatching, gauge and blocking demystified more of my projects are looking like they should. It’s exciting! I’ve never been one who follows the pack. Not at all – unless it’s the Green Bay guys. But spending a lot of time and effort to make a sweater or pair of socks or hat, then to have them look misshapen and weird just isn’t cool. Now that I know how to measure my gauge and block I’m proud to wear what I’ve made (well this project is for Becky, so I hope she’s proud to wear it). Stuff finally looks good and fits – it isn’t either down to my knees (because I understand row gauge now) or hanging off my shoulders (because I don’t just indiscriminately add stitches to make things bigger). 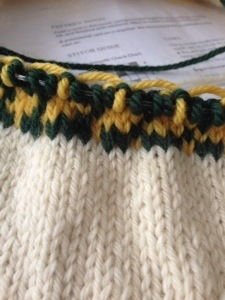 And I’ve also made a leap to applying what I’ve learned as a seamstress to my knitting. A lot of the concepts are complimentary. The difference is that, with sewing you’re buying your fabric, then cutting it and putting it back together to create a garment. 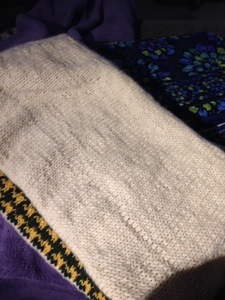 In knitting you’re making your own fabric and incorporating shaping in that creating so that, when you put the pieces together they fit correctly. Knits that fit and look good… what a concept, huh? I know a couple who love to go camping. They are very dear friends of mine and the girl half is very (VERY) clumsy. She can keep right on walking even when her feet roll over and she’s walking on her ankles, but she can’t walk a straight line to save her soul. It really is funny – she as clumsy as a ballet dancer trying to walk down a city street. 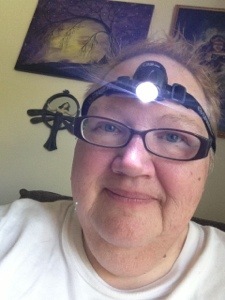 To help save her life her hubby bought her a headlamp for walking about after dark – like to (pardon my indelicacy) pee. 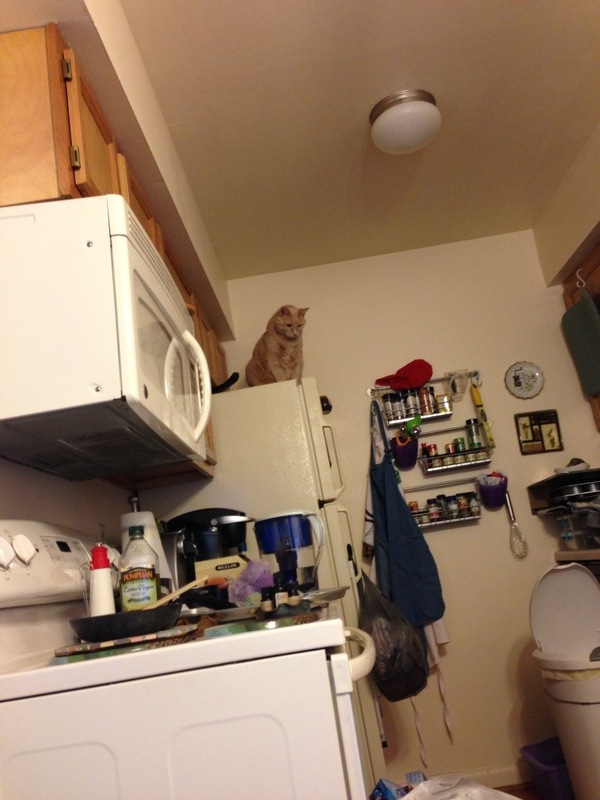 There are no lighted bathrooms in the Adirondack’s and she always seems to have to pee at 2am. She loved it and and is now on her third – that’s how much she’s used it (and fallen to break them). I always thought they were really cool, but didn’t have much use for one since I don’t camp or bike ride at night. I could use one while walking, but our apartment complex is well lit, and I tend to stay on the circle here. But I have a new passion that I’d like to practice after dark, one that required the use of both hands, so use of a flashlight would be cumbersome. And I don’t want to string lights around my patio – no place to plus them in first, and I just don’t want a lot of lights glaring down on me when I’m peacefully sitting outside in the evening. Just take a look at that neato item on my head – a sweet little headlamp! For what you ask? Need you ask? 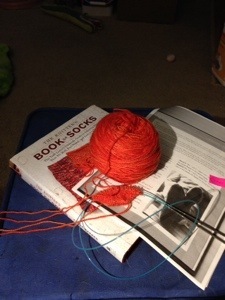 So I can knit at night! 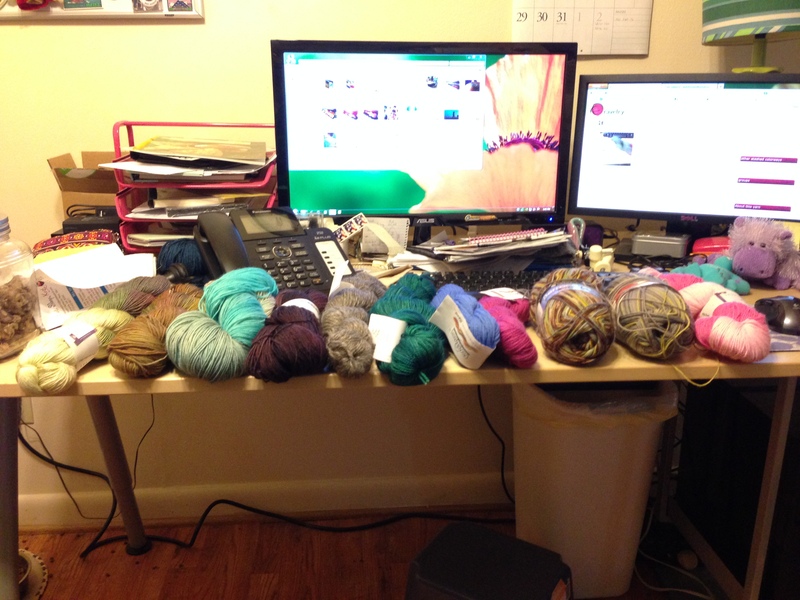 You’ve probably guessed by now that I love to knit. It has helped me relax, to focus and to quit smoking (not a cig since January). I love soft, pretty things, socks, sweaters, scarves, hats and shawls. 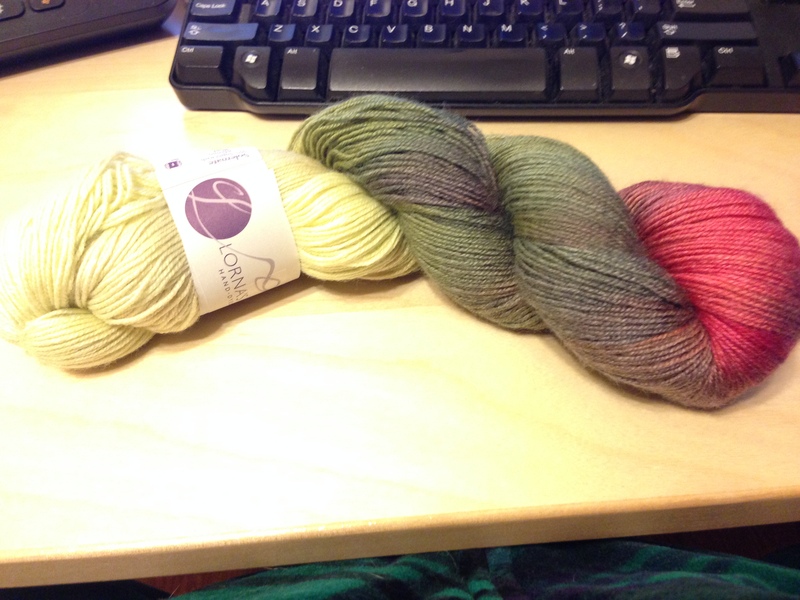 I also love yarn – the feel of it, the variety – it’s wonderful stuff. 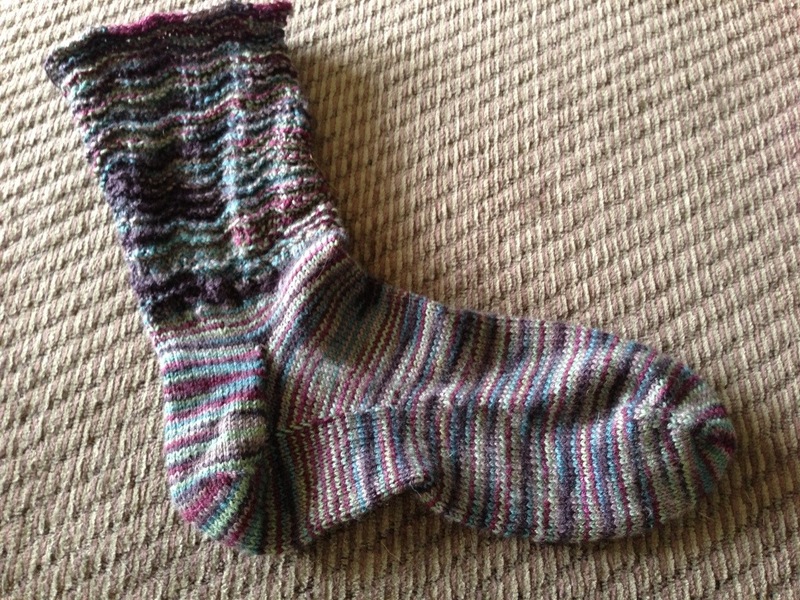 Since I’ve been knitting almost obsessively I’ve mostly used wool and its wonderful. Animal fibers. Ahhhhhh…. Lovely sheep-y wool, alpaca, llama, even exotics like opossum and cat. The feel of it and the warmth, it feels lovely on my hands and creates wonderful fabric. 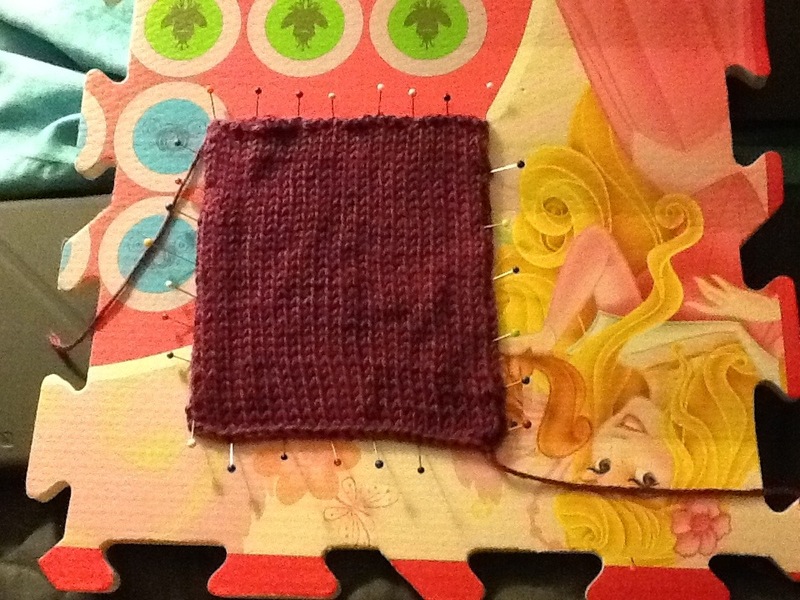 Now I’m redoing that infamous lost gauge swatch using a yarn that I’ve never tried before and I’m not all that sure I like it, or that I’ll be able to even work with it. 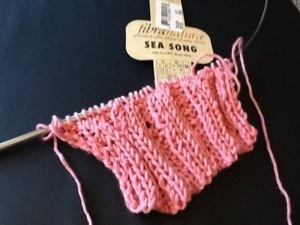 It’s called Sea Song and its made of cotton and kelp. It really intrigued me. So I’m working my swatch and really struggling with this yarn. 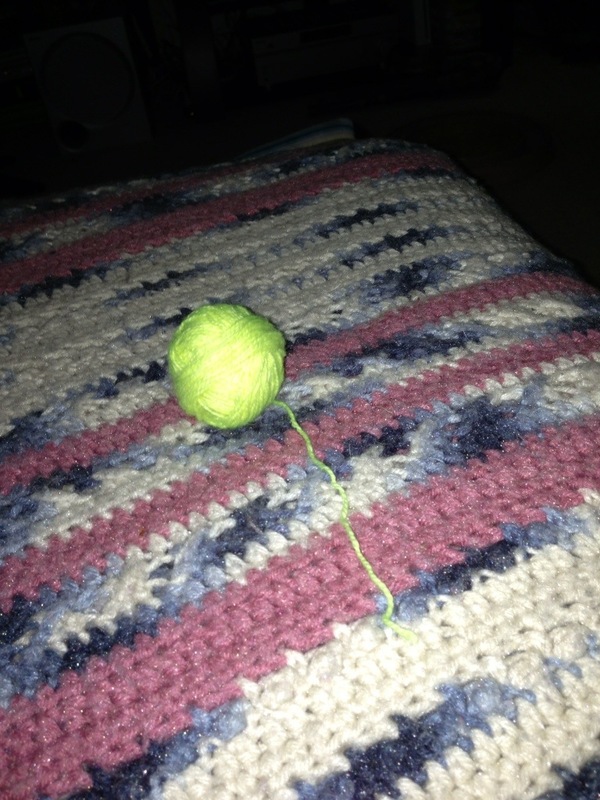 It’s very smooth, to the point of being slippery and I don’t like the way my stitches look. 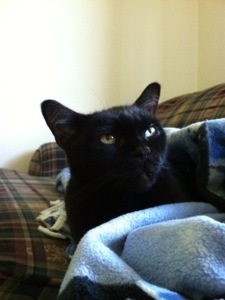 It’ doesn’t have any body and its – I don’t know, all I can think of it flabby. Plus it’s really stressing my hand. I had to put the needles down after only 20 minutes, how would I get through an entire sweater with this stuff? I don’t know if all plant-based yarns are this way, are they? 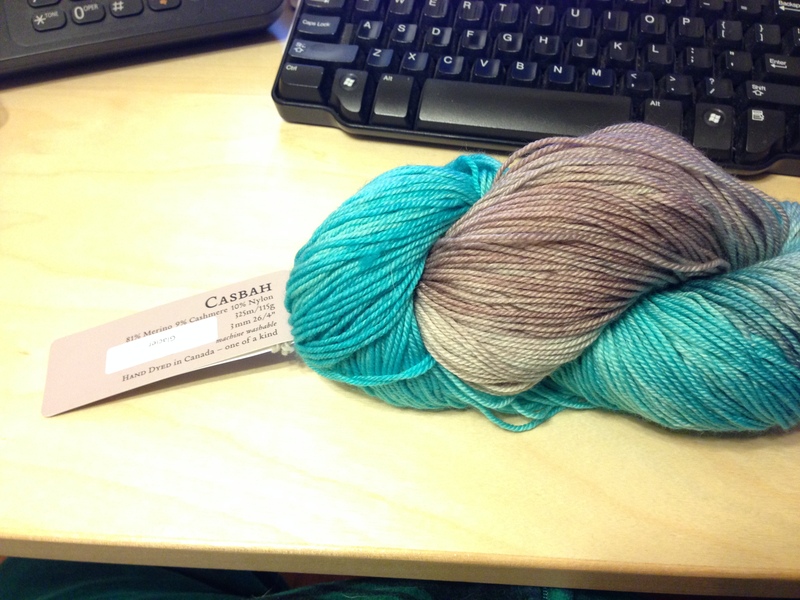 Now Cascade 220 Sport? Beautiful, smooth, easy to work with. Like buttah. 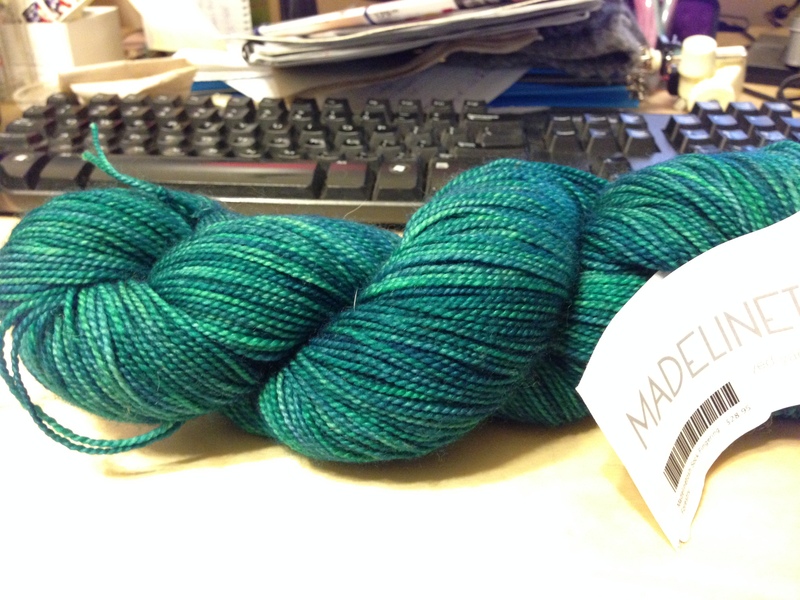 Madelinetosh? Heavenly. Plucky feet? Ahhhhhhh…. This Sea Song? Not so much. 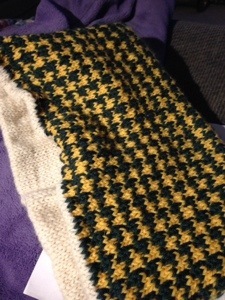 So we’ll see if I get a sweater out of this or a whole new set of dishcloths.